Studio Setup 9 is aimed towards those who want to podcast, rap, give a speech or otherwise capture the spoken word. As you can see below there is not much to this setup, but this is my attempt to steer you away from the USB microphone option. Although still basic, this setup will give you much more control and precision over your recordings than the USB mic can offer. 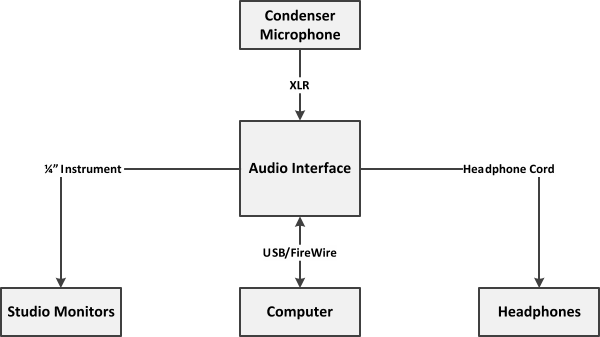 Having full control over your input levels and higher quality A/D converters are among the benefits of using an audio interface/studio microphone combination over the USB mic alternative. There is a myth that it is expensive and complicated to make a vocal recording using typical studio components, but this is not the case. With just a few pieces of inexpensive equipment you can be the next Bob Costas, Jay-Z, or Howard Stern. Wow - I bet those 3 have never been mentioned in the same sentence before.